This is unusual for a twin-tuner PVR in that it has three tuners. 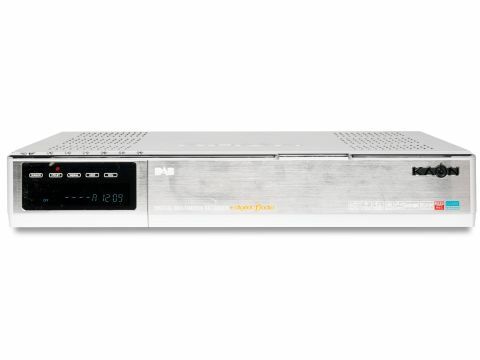 The KVR1000DAB has twin satellite tuners and a digital audio broadcasting (DAB radio) tuner (although the DAB tuner is not very sensitive). With the KVR1000DAB you can record up to six satellite channels at once, and either a DAB station or an external analogue TV input (from, say, a Sky Digibox). You can even watch two of these sources at the same time with the PIP function. It's all really flexible and the KVR1000DAB handles the tuner choice for the six satellite channels well, listing onscreen only the channels that are available at the time. The two satellite tuners are kept at arm's length with their own channel lists, though these can be identical if a twin-output LNB (or LNBs) are used (duplication reduces the attraction of the 8,000-channel memory). Once one tuner is set up, its channel list can be copied to the other, luckily (the KVR1000DAB is slow to find channels; it took nine minutes to scan Astra alone). The tuners can both control a DiSEqC LNB switch but only for up to four LNBs, so for more wide-ranging satellite access a DiSEqC motorised dish can be used (and the KVR1000DAB is USALS-compatible). A hefty 250GB HDD is fitted in an accessible caddy, so you could fit a larger drive. However, PVR playback is a little disappointing; not for quality (which is excellent for video and audio), nor even for the rather limited controls (except for the very useful 10 sec back and forwards jump buttons), nor that there is no capacity to edit recordings.